A summer visitor to the West! The Flammulated Owl is a study in camouflaged grays and browns, with cinnamon-brown shoulder straps and large brown eyes. This astute aerial predator stands a little more than six and a half inches tall, from its sharp-clawed feet to its stubby, ear-like tufts. It winters in southern Mexico or Guatemala and nests in old woodpecker tree cavities, occasionally evicting the original occupant. Support for BirdNote comes from Forterra – creating great communities and conserving great lands in Washington State. 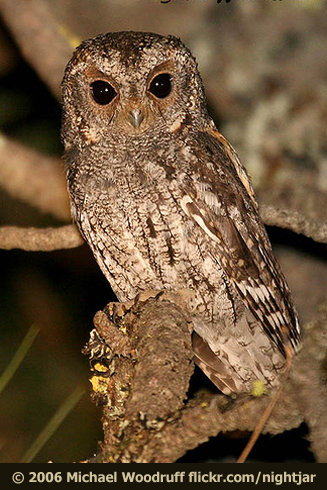 Just as late-summer darkness fully envelops a mountain pine forest in the West, a male Flammulated Owl begins to hoot. A shimmer of moonlight reveals a tiny owl sitting high in a Ponderosa pine. Abruptly the owl glides out and then hovers momentarily, catching an airborne moth in its talons. A mere six-and-a-half inches tall but with a sixteen-inch wingspan, the Flammulated Owl seems built much like a large moth itself. It’s a study in camouflaged grays and browns, with cinnamon-brown shoulder-straps and large brown eyes. The Flammulated Owl nests in old woodpecker tree cavities – and has even been known to evict the occasional woodpecker, if no other cavity is available. Its life and livelihood depend on healthy, mature ponderosa pine forests. In constant search of insects to feed on, this diminutive owl rates as the most migratory of all the owls that nest in North America. In late summer, the birds will be gone, off to southern Mexico or Guatemala for the winter. But next spring, along about mid-May, you can hear the Flammulated Owl again, as the stars brighten over the mountain forests. Hoot of the Flammulated Owl and sound of crickets provided by The Macaulay Library of Natural Sounds at the Cornell Lab of Ornithology, Ithaca, New York. Owl recorded by D.S. Herr; crickets (unedited) by Nigel Tucker. Like to make a gift to BirdNote? Begin here.